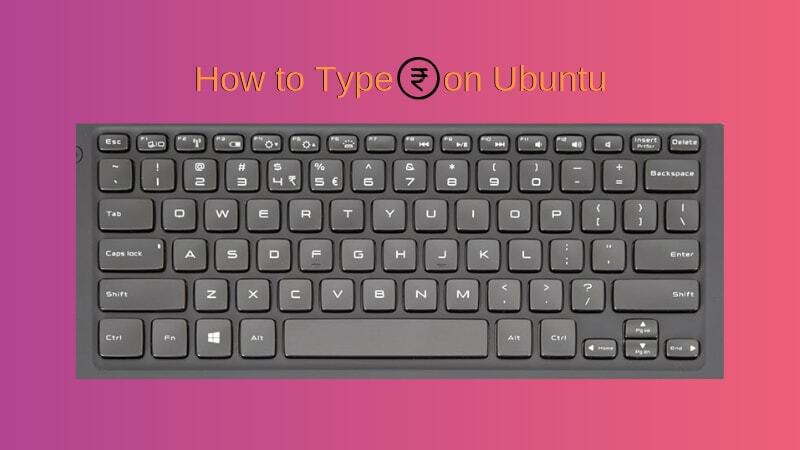 This step by step tutorial shows you how to type Indian Rupee Symbol on Ubuntu 18.04 with GNOME desktop. This procedure can also be applied to other desktop environments as well as other Linux distributions. In 2010, the government of India unveiled the ₹ symbol for its currency, the Indian rupee. It has the unicode character U+20B9. Over the time, the ₹ symbol started appearing on keyboards, both Indian and international. It is placed on the key 4 with US Dollar $. Now typing $ is pretty straightforward. You use Shift+4 and you get $ symbol. But that’s not the case with ₹. It’s the third symbol on the key 4 and the question arises, how to type ₹? To use the third symbol on any key (like the € on key 5), you have to use the AltGr (or the right Alt) key with the symboled key. So if you use right Alt+4, you should get the ₹ symbol. But that doesn’t happen all the time. You have to do a few changes in order to type ₹ sign on Ubuntu. Try Right Alt+4 key first and see if it works by default. If it doesn’t, you can follow the rest of the tutorial to get the ₹ support on your Ubuntu system. In order to type ₹ on Ubuntu, you need to use the Indian English keyboard with Rupee. No, I am not asking you to buy a brand new keyboard that has ₹ displayed on the key 4. I am suggesting to add this keyboard layout on your operating system. Let me show you how to do that. Just so that you know, the same steps could be applied to other desktop environments like MATE, KDE Plasma etc. The screenshots won’t look the same though, so you would need to find your way through on your own. In the Settings, look for Region & Languages and in here click on the + symbol under the Input Sources. This is the way to add a new keyboard layout. Click on the three vertical dot symbol to display more keyboard layouts. The search option may not work. So, you may have to scroll down and look for English (India). Click on it. You would expect that it will add the English (India) keyboard immediately but that doesn’t happen. You’ll have plenty of keyboard options under English (India). Look for English (India, with rupee). You can also search with rupee here. Once you have found this keyboard, click on Add button to add this layout. Now that you have added the English (India, with rupee) keyboard, it’s time to use it. You can use the Windows + Space keyboard shortcut in Ubuntu 18.04. to change the input source i.e. to change the keyboard. If you are going to use the Rupee symbol all the time, you should make English (India, with rupee) the default keyboard. You can do that in the Settings by moving it up the order. Note: You may have to log out or reboot after changing the default keyboard so that these changes take into effect. This will type the ₹ symbol. Note that you don’t need to have the ₹ symbol on the key 4 on your physical keyboard in order for this to work. It will work irrespective of whatever physical keyboard you are using. I hope you were able to type rupee symbol after following this tutorial. If you have any questions or suggestions, please use the comment section below.